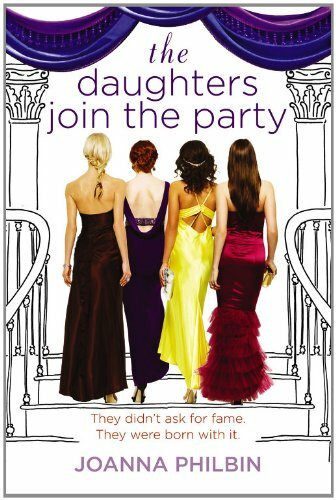 The Daughters Join the Party by Joanna Philbin. Little, Brown and Co., 2011. Currently available. Face Value: This book is part of a series, and the covers all have the same concept for the design: you see the back half of some girls as they partake in an activity related to the story. I am not a fan of book covers that de-personalize characters by concealing their faces, especially female characters. Also, one of those girls is supposed to be Emma, who totally wouldn’t wear any of the dresses in that cover image. One of Emma’s key qualities is her unconventional style – so they should at least acknowledge that by putting one of the cover models in Doc Martens or something. Does it break the slate? Yes! Given the cover packaging and the fact that this is the fourth book in a series about celebrity daughters, I started reading with a healthy dose of skepticism. But Emma Conway is absolutely a Slatebreaker, and she remains one despite the limitations imposed upon her family during her father’s presidential campaign. Who would we give it to? A young reader who struggles with a parent’s career in the spotlight would enjoy this book. Emma’s experience of being simultaneously excited about and frustrated with her father’s campaign could resonate with a lot of kids who have to live their lives in public scrutiny, thanks to their parents’ careers. Review: Did you notice the last name of the author? It’s Philbin. As in Regis Philbin. Yes, Regis’s daughter Joanna writes a series of YA books about the daughters of celebrities. I guess the advice to “write what you know” really stuck with her. I was impressed by Philbin’s approach to the celebrity daughter concept. Emma Conway, the protagonist of this fourth book in the Daughters series, is surprisingly well grounded despite her father’s status as a junior senator for New York and a rising political star. Yes, Emma goes to fancy schools and can afford a nicer handbag than the rest of us, but she also has some very typical life challenges. She struggles with her self-esteem and worries that she doesn’t fit in at all with her family. Because her brother is super smart, she feels that she can never compete academically and thus screws around in school, gaining a reputation as the family failure. Emma hits rock bottom when she gets expelled from her fancy boarding school for trying to sneak into a boy’s room. On the same day she gets expelled, she learns that her father is going to run for president – and Emma realizes that her whole world is about to change. Now her rebellious behavior has effects that she cannot even comprehend, and could possible jeopardize her father’s career. Once Emma has transferred to Chadwick, the private school at which her brother reigns supreme, she is wary about fitting in. And she has to watch her behavior now that her father’s campaign is heating up. Luckily, Emma fits right in with Lizzie, Carina, and Hudson – the other three celebrity daughters of the series, who happen to also attend Chadwick. Emma finds herself taking on greater responsibility as her father’s campaign gains strength. She makes an impromptu speech one night, and the media loves her so much that she becomes a regular feature on the campaign circuit. Emma struggles with this new role as “campaign darling.” Her initial speech was totally improvised, and would have gotten her in major trouble with her parents and the campaign manager if it hadn’t been so well received by the media. But the speeches she gives on the campaign trail are canned, pre-written, and don’t reflect Emma’s true values. Although she is excited about finally being respected by her parents, Emma chafes at the restrictive nature of these campaign appearances. She feels divided, and must decide whether or not she still wants to be involved in the campaign if it means she has to act like someone she will never be. Emma is a very appealing heroine because she is definitely flawed. She is too spontaneous, and even her friends tell her that she needs to stop and think more before she does something outrageous. Yet it is her spontaneous quality that makes her a superstar of her dad’s campaign – the media loves that a senator’s daughter has such a refreshing take on the current state of youth in the US. As a Slatebreaker and a daughter in the spotlight, Emma has more power than she realizes. Even an offhand comment has major repercussions, because it could be reported nationwide in an instant. Emma has to think about her behavior in a way that most of us can avoid when we are adolescents. Yes, we make mistakes and our parents get mad and then we move on. We grow up to regret those stupid decisions but we can still be excellent, contributing citizens. Emma’s mistakes, however, affect way more people. It’s a lot of responsibility for a fifteen-year-old girl, but Emma handles it pretty well. Yes, she fumbles along the way, but that’s what makes her such a lovable character. She’s definitely human, even though she lives an extremely privileged lifestyle. Even if they’re not living the celebrity lifestyle, readers can appreciate Emma’s tough choices. I found this book to be very thought-provoking as I watched the media coverage of candidate’s families. I wonder if anyone has ever given Sasha and Malia Obama a copy of this book – and I wonder what they would say about it. It’s something that I will definitely think about as I watch the results come in next Tuesday night. Reviewed from a copy purchased at Bookworld in Marquette, MI. This entry was posted in Reviews, Theme Week, Young Adult and tagged children of politicians, Election Week, presidential campaign, Theme Week. Bookmark the permalink.